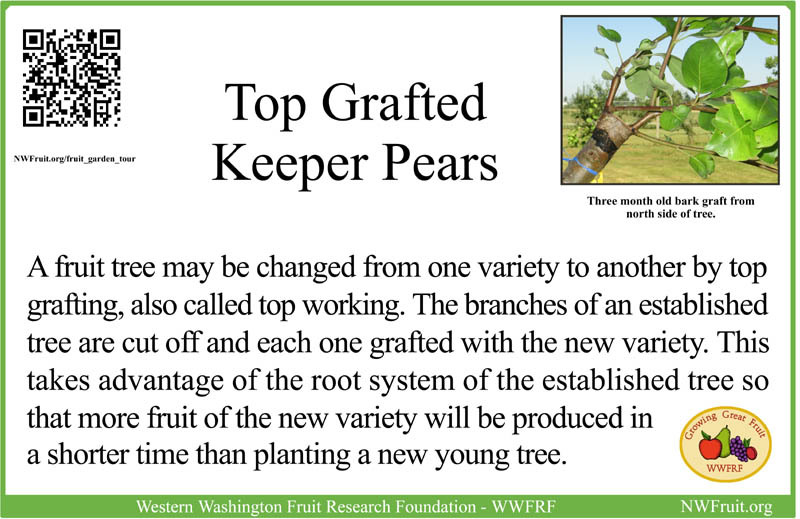 We wanted to have some keeper (storage) pears in the Fruit Garden, and we had quite a few large Bosc pear trees on quince C rootstock, which dwarfs the pear, so we decided to top graft some of the Bosc pears over to the following keeper pears. 1. Pound is a variety which has been around since Roman times. 2. Suij is an old Dutch variety. 3. Saint Remy is a larger cooking pear. It is a hard, green pear that when cooked becomes a firm, sweet/sour pear. Several types of grafts can be used to top graft. Cleft graft and bark graft are two of the most common. Bark grafts were used on this project. 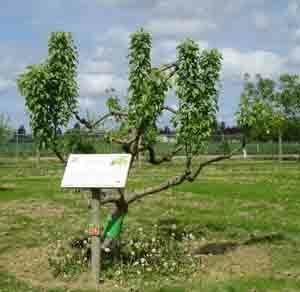 Each branch is labeled with the variety which has been grafted onto it. Sometimes the tree is grafted over all at once, but with larger trees it is often grafted over a period of two or three years, as in the case with this tree, in order to leave some full branches to support the health of the tree during the transition to a new variety. The first year the upper tier of this tree was cut back but allowed to grow to provide leaves to support the tree. The second year the grafts in the lower level were well established and the upper tier was removed. The top tier of branches has been removed.